Torquay has come a long way in its history. From the ancient cave dwellers who lived out their lives under conditions that would make the people of the 21st century shudder, to a modern, thriving resort. It is probable that Roman soldiers inhabited the area during the time of the Roman Empire as they did most of England. In the 1800's the famous local archeologist, William Pengelly, investigated a site which he found to be a settlement from the Roman era in England. Artefacts from this dig are in Torquay Museum. 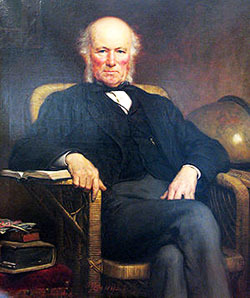 William Pengelly also investigated Kent's Cavern. Our knowledge of prehistory owes a great deal to William Pengelly and his fellow archeologists. The name Torquay comes from Tor and Quay rather obviously. 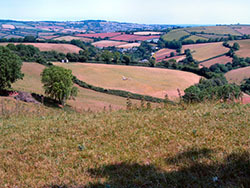 Tor is a weathered rock outcrop, very much a feature of Devon. It is in the county that this term originated. Tors were often places very special to Celtic people. Torre was Torquay's ancient name. On Tor Hill Road there are extensive remains of a very old quarry and this is where the name came from. Quay is a later addition. 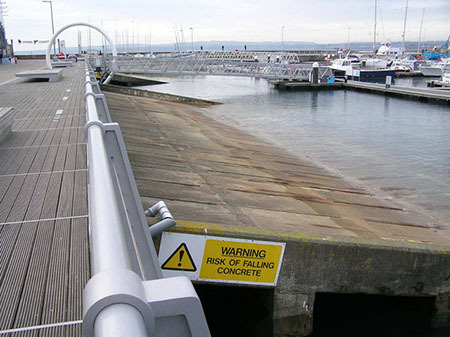 As the fishing grew in the area the quay would have evolved. 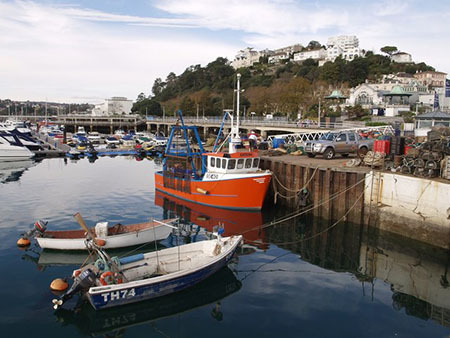 Fishing and agriculture were the main occupations of Torquay for centuries. It developed into a seaside resort in the 1800's with the presence of the Royal Navy in the Napoleonic Wars. Royal Naval ships anchored in the Bay and its officers and their families made Torquay into a fashionable resort. The town became a health resort because of its climate and got the nickname The English Riviera which stuck. The named is well deserved really as many modern visitors will testify. In World War II Torquay was an embarkation point for the D Day Landings. All along the southern coast of England navies, armies and airforces of the Allies were preparing to cross the English Channel to the Normandy beaches of northern France. It was a massive operation. Did your ancestor leave from here? Home of Torquay's first residents. Thousands and thousands of years ago humans lived in this cave. It did not have a sea view, it was a wooded valley ideal for their hunter gatherer lifestyle. Now we can see how they lived for Kent's Cavern is open to the public. Allow about an hour for the interesting tour and another hour and half to see everything else. Plenty for children to do. Torquay's most famous historical building. It can be found in the centre of the town. Not only a historical Abbey but houses an art collection and has beautiful gardens. Well worth the visit. Or you may prefer to browse some more, please do. There are navigation buttons above on the left.